Presenting the new masterpiece in the Da Vincis Diamonds slots series, Double Da Vinci Diamonds! 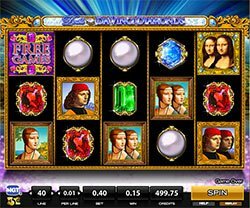 The sequel to the original Da Vinci Diamonds slot machine has 40-paylines across its 5 reels and features some of the artist and inventors most famous works of art. Presenting the new masterpiece in the Da Vincis Diamonds slots series, Double Da Vinci Diamonds! The sequel to the original Da Vinci Diamonds slot machine has 40-paylines across its 5 reels and features some of the artist and inventors most famous works of art. Leonardo Da Vinci was one of the most brilliant minds and incredible artists to have ever graced this planet. For you to win large in this game, all you have to do is discover combinations of some of his priceless works of art and hidden diamonds! The slot is set on an elegant background, characteristic of the time when Da Vinci was around. The User Interface of the game is pretty standard and simple to read. The real ‘gems’ come in terms of the great symbol art work on the reels which depict famous works of art like Mona Lisa, Lady with an Ermine and Portrait of a Musician. These works also come with a twin on some symbols to create IGT’s Split Symbols feature. Split Symbols – Each of Da Vinci’s portrait works of art can be shown as a single portrait or a double as a Split Symbol. The split symbols will count as two symbols instead of just one to increase your chances of hitting combinations! Tumbling Reels – With the Tumbling Reels feature, all symbols that form part of a winning combination will disappear and the empty positions on each reel are filled with new symbols tumbling from above. Free Games Bonus Round – Getting three Free Games symbols in any position on the reels triggers the free games bonus where you’ll win between 6 and 16 free bonus games!